Ancient Chugach burial caves, hidden in outcroppings all along the rugged coastline of Prince William Sound in Alaska, are accessible only by small boats such as kayaks. For more than a century, these sites have been looted for their artifacts, masks and skeletal remains. The increase of kayakers, who can nose into areas difficult to access any other way, is a worry to tribes working to preserve what little evidence of their material culture remains. In October last year, the Anchorage Daily News reported the return of seven large masks from the Smithsonian Institution’s Virginia warehouse to the Chugach natives. They are the only masks to be returned to the Chugach, who have pitifully little of their material culture left after more than two centuries of colonial rule, first by the Russians and English, then by Americans. These resource-extraction-driven settlements changed the trajectory of native culture forever. John Johnson, cultural resource manager for the Chugach Alaska Corporation, works, through the 1990 federal Native American Graves Protection and Repatriation Act, to secure the return of artifacts and human remains taken from burial caves. He is one of dozens of cultural resource managers working for tribes along western U.S. and Canadian coastlines-from Barrow, Alaska, and along the Bering Sea, in the Aleutian and Kodiak archipelago, through the Inside Passage, and down the Pacific coast to Southern California. The seven recently returned masks and an undisclosed number of “mummies” were sold to the Alaska Commercial Company in 1875 for $12. No one knows what happened to the human remains after they were sold. Pothunters still search for artifacts in shell middens (large refuse piles of shell and bone) and old village sites along the coastline, even though federal law prohibits the possession of cultural remains; but the problem for tribes lies deeper than that. Fiberglass kayaks are much tougher than most people think they are. A solidly built glass boat is perfectly capable of landings on rocky shores and will hold up for years with some simple maintenance. However, any kayak will eventually start to show signs of wear. Most boats wear along the keel line, particularly at the ends. Whitewater canoeists are used to applying skid plates to these areas of their boats. Many kayakers in Great Britain, where rough landings on rocky shores are common, apply a bow-to-stern keel strip to their kayaks. A keel strip is also a great way to repair a composite kayak that has been abraded at the stems and is a good preventive measure if you’re planning a long expedition in exposed conditions. A keel strip is essentially a piece of fiberglass or polyester tape saturated with resin and covered with thickened gel coat. The process of applying a keel strip involves masking and prepping the hull, laying on the fiberglass tape and finishing over the tape with gel coat. The whole project can easily be completed in an afternoon if you have the materials assembled and a warm place to work. The first step is to make sure the hull of the boat is clean and free of contaminants. I usually give the hull a wipe with denatured alcohol before masking. Acetone will also work but is much more toxic to handle. As with any fiberglass project, make sure to take proper precautions to protect yourself from vapors and contact with chemicals. Work in a well-ventilated area, and wear gloves and a respirator. We’ll be working with polyester resin because of its quick cure time and forgiving nature. Unfortunately, not all kayaks are compatible with this material. If your kayak is made of epoxy, you won’t be able to apply a keel strip using these directions. Luckily, almost all commercially manufactured kayaks are made with polyester or vinylester resin. If your kayak was made with a different material, such as epoxy, it’s likely that the manufacturer has noted that in its advertisements. Check with the manufacturer before starting this project if you suspect that your kayak is made of another material. Once you’ve cleaned the hull, run a piece of two-inch-wide masking tape down the center of the keel line from bow to stern. This will be your guide for masking the rest of the job, so make it straight. Trim the ends of the tape off square or to a point, depending on your aesthetic preferences. The best tape to use for this job is the blue masking tape made by 3M. This tape is easy to remove and won’t leave a residue of adhesive on the gel coat. It’s more expensive but well worth the extra money. The next step is to run a strip of one-inch-wide masking tape down either side of the central piece of tape. This layer of tape should be just under a quarter-inch outside your two-inch guide strip. Finish the ends the same way you finished the original piece. Once you have the one-inch tape firmly rubbed to the hull, remove the center tape and discard it. You should now have an area approximately two inches wide masked off down the center of the kayak. Next, abrade the gel coat outlined by the tape. Roughing the surface will assure that the polyester resin will adhere properly. This is most easily done by using a flap brush with an electric drill. The type that works best for this project has nylon bristles arranged in rows around a drum: It won’t remove the masking tape from the hull when you start sanding. Brushes with more tightly arranged bristles will. Getting the proper flap brush will save you a lot of masking headaches. Wear a dust mask, safety glasses and hearing protection while using the sanding bit. Work the brush all the way down the center of the masked area, overlapping the tape to ensure that the entire surface has been prepped. Give the prepped surface a quick wipe with acetone to remove the dust from sanding. Now you’re ready to finish masking. The next strip of one-inch tape is applied overlapping the outer strips and covering only 1/8-inch of the sanded gel coat. Run the tape all the way down the hull on both sides so that you have two pieces of tape forming the border of the keel-strip area. If you have a skeg in the boat, run two pieces of tape over the skeg box, overlapping each other at the center. Trim these pieces to shape with a razor knife, just outside the perimeter of the skeg box opening. Two pieces of tape are then used to separate the skeg box area from the rest of the masked strip. The fiberglass tape won’t actually cover the skeg box area, but the gel coat will. Once you have finished this final masking, give the boat another wipe with acetone. Now you’re ready to apply the fiberglass. Mix up a batch of waxed polyester resin according to the directions provided on the container. I prefer to use 10 to 20 percent more catalyst than is recommended. This creates a “hotter” mix that will cure more quickly. You will be working the fiberglass tape into shape as it cures, so it’s nice to have a mix that goes off fairly quickly. As the resin gets tacky, you can use a cheap bristle brush to get the tape pressed neatly to the hull. Polyester resin is fairly tolerant of imprecise ratios, and I’ve had good success with this technique. Waxed polyester resin is used because the wax in the mix will rise to the resin’s surface as it cures. This isolates the resin from oxygen and promotes a quick, hard cure. Unwaxed resin would remain sticky for far too long when used in this application. Make up a big batch of resin—10 ounces should do it. You don’t want to run out halfway through the process. Roll out a piece of two-inch fiberglass tape onto the hull of the boat and cut it to size. If you have a skeg in the boat, you will need two pieces: one to run from the front of the skeg box area to the bow and a second to run from the rear of the skeg box area to the stern. The tape will lengthen somewhat as you brush it into place, but you will be trimming it later after the resin has been applied. Using an inexpensive bristle brush, apply a layer of resin to the hull between the masked lines. Roll out the fiberglass tape starting at one end and moving to the other. Apply resin to the tape once you have laid it into position. Again, start at one end and work toward the other. Try to keep the tape straight, and work the resin into the fibers so that it becomes a uniform, translucent color. As you reach the turn of the bow or stern, the tape will resist lying down smoothly. This is where you need to continue working until the resin begins to cure. As it starts to cure, it will get sticky, and the fiberglass will lie down and adhere to the gel coat. You will be pulling the top layer of masking tape off the kayak before the resin becomes too hard. You want the resin to be slightly thick, like the consistency of molasses, when you do this. Pull the masking tape across the center of the boat as you remove it. This pulls any residue from the resin back onto the resin-saturated fiberglass tape and creates a neat line. Remove the two cross pieces of masking tape in the skeg box area at this time. As the resin becomes “green” or partially cured, use a razor knife to trim the fiberglass tape into the desired shape at the ends. Repeat the process with the other end of the kayak if necessary. While all of this has been going on, you will have been mixing up the gel coat concoction. Mix about two parts clear gel coat with one part waxed polyester resin. To this add microballoons to thicken the mixture to the consistency of thick pancake batter. You will want about 16 ounces of thickened gel before you start. Use pigment to darken the gel coat to the desired color. Black, red and yellow are commonly available pigments. Light gray might be the most practical color to mix, as most kayak hulls are white. The microballoons will lighten the color of the dried gel coat, so it’s important to add a lot of pigment to get the right effect. White is, obviously, the easiest color to work with in this respect. However, it’s nice to have the keel strip a different color from the rest of the hull so you can tell when it’s wearing thin. You can always start with a ready-made colored gel coat, but you will get a very light result unless you add pigment to the mix. Once you have the desired thickness, add the appropriate amount of catalyst to your gel coat. The thickened gel coat needs to be applied to the keel strip before the resin has fully cured. The best time to do it is immediately after you have removed the first layer of masking tape and trimmed the ends of the fiberglass. Use a two-inch-wide paint brush with soft bristles for this part of the job. If you have the gel coat at the right consistency, it will flow onto the weave in a thick layer, leaving few brush marks. If it’s too thin, you’ll have a shiny layer of gel with weave showing through. Too thick and it won’t flow properly off the brush. Again, thick pancake batter is what you’re looking for. You can test the consistency before adding hardener by painting over a piece of scrap fiberglass that has been taped to wax paper. The gel coat mixture should fill in the weave and shouldn’t run down the paper if you set it on edge. You won’t have to wait too long before removing the second set of masks. Your thickened gel coat should not run down the hull once you remove the tape. As before, pull the masking tape across the center of the boat to allow the partition line to roll back onto the gel coat. Use a razor knife to pull up the edge of the top piece of masking tape covering the skeg box. Remove this strip, pulling toward the gel-coat area. Repeat with the second piece of masking tape. Don’t wait too long to begin removing the tape. You want the gel to drip back into the center of the strip and be absorbed into the rest of the finish. Wait too long, and you won’t be able to pull the tape off—the gel coat will already have hardened. I usually check by sticking my gloved finger into some of the curing gel on the masking tape. You just want to be sure that it won’t run. It sounds difficult, but it really isn’t. You will have had a chance to practice on the clear resin before you tackle the cosmetic gel coat. No matter what you do, the result will have the requisite strength. Good timing just makes for a more professional-looking result. It’s worth mentioning that some of the materials commonly used in the U.K. for keel strips are hard to come by in the States. Diolene tape and waxed styrene in particular are tough to find. Neither is essential for this project, but some people prefer Diolene over fiberglass because of its toughness. Diolene is a trade name of a special kind of treated polyester cloth used to increase impact-resistance in layups. This material is harder to work with than fiberglass, but it will last longer before wearing through. Note also that Diolene tape has a width of 60 mm, a bit wider than two-inch fiberglass tape. If you find it, you will have to mask your center stripe to 60 mm before beginning to prep. Waxed styrene is often used to add wax to the gel coat layer. Adding waxed resin to the mix will do the job pretty well, but if you have waxed styrene, it helps to add a couple of tablespoons. You probably won’t be able to buy pre-waxed styrene, but you can make it at home. To make “styrene wax,” simply mix paraffin canning wax with styrene. Use a razor knife to shave tiny feathers of wax into the liquid. Keep adding wax until it stops dissolving. Mix the concoction a little bit at a time, or make a big batch and save it in a glass jar. You can buy canning wax at most grocery stores, and you can order styrene through a marine supply house. Congratulations—you have just finished your first keel strip! This piece of fiberglass will make your kayak much tougher and will provide a sacrificial layer to take abrasions that would otherwise damage the hull. It may be necessary to refinish the keel strip from time to time as it wears. Simply re-mask the edge, rough up the surface with the nylon flap wheel, and apply a new layer of thickened gel coat. Adding a keel strip is a great way to beef up an aging kayak or prepare a new boat for an ambitious trip. Don’t be afraid to tackle this project at home—the results are well worth the effort. Brian Day is a BCU Level-3 sea-kayak coach. He has been paddling sea kayaks since 1992 and whitewater since 1994. Depending on the season, you’ll find him either running whitewater, paddling canoes in the Boundary Waters of Minnesota, or kayaking on the sea. He is currently living and working in Ely, Minnesota. Some call them blackfish or killer whales. Old salts still refer to them as grampus. They are playful, highly vocal and, for 10-ton carnivores, are rarely aggresive. I heard the orca long before seeing them. On the flat waters of British Columbia, sound skims along like a stone. You can hear a blow miles away. In late August, salmon are in town and have set the upper echelons of the food chain in motion. Orca eat salmon, and the Johnstone Strait is a 24-hour cafe. For those interested in whales, this is the place to be. Some call them blackfish or killer whales. Old salts still refer to them as grampus. Orcinus orca is a highly social mammal that cares for young and old, staying together in the same pod for life. They are playful, highly vocal and, for 10-ton carnivores, are rarely aggressive. Until the early 1980s, they were routinely shot at by fishermen or captured to serve life sentences in theme parks. Fortunately, the powers that be finally recognized them to be a highly evolved species, and today they are protected. In captivity, they might live 20 years. Here in the wild, they can reach 80. I had paddled the Strait for four days and had seen them far off each day. They are known to approach kayaks and had done so to me in the past, but it had been years since one was really close. On my first kayak trip, I had been no more than a mile from this very spot when a pod of three transients came at me like a black-and-white freight train. They must have been doing 20 knots when I first spotted them about a mile away, and in the time it took to pull out a camera, they were almost in my face. The two females broke toward shore and avoided me entirely, but the bull came straight on. His dorsal looked about 10 feet tall that morning, and when he surfaced in front of my boat, his mouth was wide open and all I saw were tongue and teeth. I squeezed the shutter and got a shot of him but have no memory of doing so. Taking the photo was an instinctual reaction. That first encounter was so frightening, it still comes back to me in small flashes. I was so intrigued by this monster that could easily have killed me, yet only gave me a curious once-over. The more I learned about orca, the more I had to know. I have found these whales to be at least as intelligent as dogs, if not more so. They have a highly developed language, care for their young and old, mourn their dead and coordinate their hunts in a manner that implies a rather complex thought process. Orca live in a society. The alpha female rules the pod and the alpha bull protects it. They leave the pod to mate but return when finished and spend their entire life together. These mammals are very high on the food chain and not because of brute force. They think! And that makes them fascinating. I have never heard or read of an attack on humans or kayaks, even though transients have been known to come on shore to take a mammal for a meal. Aside from the initial shock of that first encounter, I have never felt threatened or endangered at all in their presence. Four days in a kayak is a long time when you are over six feet tall. I was stretching out a cramp in my leg and taking a drink of water when I heard the familiar “whoosh.” A large black dorsal was coming right at me from three o’clock, about 500 yards out. I kicked my rudder hard right, dropped the water bottle and quickly reached for the camera. Then I heard a second “whoosh,” and a third. Suddenly, whales were blowing all around me. They seemed to be converging on my boat, and for a split second I experienced that phenomenon known to kayakers as terrifying euphoria. I had waited a long time to see them so close but never expected to have dozens coming on like waterborne trucks. The beaches of B.C. are mostly small, loose rocks. I happened to be opposite a rare cliff wall rising about 15 feet high. It ran for about 200 yards. Dozens of orca were converging on this wall, and I was in their path. They were driving salmon ahead of them into the wall. The salmon, in their panic to escape, were ramming headfirst into the rock, knocking themselves senseless. The orca zipped left and right, picking off the dazed salmon. Dorsals sliced through the water like so many black knives. Many came close enough to touch, but I was not about to stick out a hand while these carnivores were feeding. Logic does not always enter the brain during moments of high adrenaline rush. I took several photos and tried not to move. Once the initial wave of attackers passed me, I realized I was privy to a natural phenomenon very few would ever experience. I sat there watching as a great struggle of life and death played out before me. Salmon broke the water in all directions only to be taken in mid-flight. I saw several fish grabbed midair but was not quick enough to capture any of it on film. In fact, at this point, I was not even trying. I was simply being in the moment, totally in awe of what was unfolding before me. This went on for the better part of an hour. As the frenzy began to subside, I watched four orca line up parallel to the wall and turn their flukes toward it.They commenced to slap the water with their tails, making large waves that crashed against the rock. They were using the water to dislodge the remaining salmon hidden in the cracks. As the final stragglers rushed from their hiding places, small dark flashes jumped to take whatever fish the initial assault had missed. These were a pod of Dall’s porpoise, following the orca and cleaning up the stragglers. Porpoise often swim with orca, and there were plenty of fish to go around. Spouts of water were kicking up everywhere as the hapless fish swam for their lives. The Dall’s were ballerinas, arcing out of the water, taking salmon in their mouths and diving back in one smooth motion. The porpoise formed a ring, keeping a respectful distance from their larger cousins who were in command, and allowed no victim to escape. By now the entire event had taken on the aura of a grand play, and I was in the center of it all. I tried to pick out the biggest bull to see how he conducted himself during the scene. There were two or three around, but they just didn’t seem to be in charge. Somewhere close by, out of sight, was the alpha bull, silently watching. I turned my boat slowly, trying not to disturb the water any more than necessary. I simply did not want to draw any attention to myself at this time. Then I saw him. He was about a half mile out and had not been part of the hunt at all. He calmly swam back and forth, watching over things, making sure his cows and yearlings executed the hunt properly while he kept his distance. He was either already well fed or so into his role as protector that he let all those tasty morsels pass. He was perfectly aware of my presence even though I hadn’t seen him until the hunt was almost over. His toleration of my being between him and the pod was proof that he considered me no threat. He was broadside to me with his head slightly elevated—enough for his small black eye to make contact. I felt that he knew what I was thinking at that moment, and we understood each other. I could watch as long as I didn’t interfere with the natural order of things. I had in effect been allowed to witness a highly secret ceremony, and the leader was telling me it was time to move on. I began to paddle slowly, away from the alpha bull. Females and yearlings passed by me covering me with their blow. The pod was reforming around the bull. As quickly as it began, the hunt was over. I counted 18 dorsals logging on the surface. I guessed they were just sitting there while heads were being counted to make sure no one was left behind. Suddenly the large female brought her flukes up and smacked them down. With that, the pod turned and headed north. When they surfaced, a few minutes later, they were far ahead of me. I sat quietly for a few minutes, trying to absorb what had just happened. They were perfectly aware of my presence and tolerated it even though they were engaged in the deadliest activity of all, the hunt. I had been given an incomparable gift. Since that day, I have often thought of what it might be like to one day actually communicate with these creatures. Then it finally hit me:They had communicated with me. The entire hunt had been a communication by executing it with me in the center. They allowed me to see an inner part of their daily life that maybe only a handful of people will ever be able to witness. When an outsider is allowed into a closed society, it is the highest form of flattery. When it happens between species, it is a cosmic experience. I can only hope one day to truly understand these creatures that not only share our planet but also allow me to peacefully enter their domain. 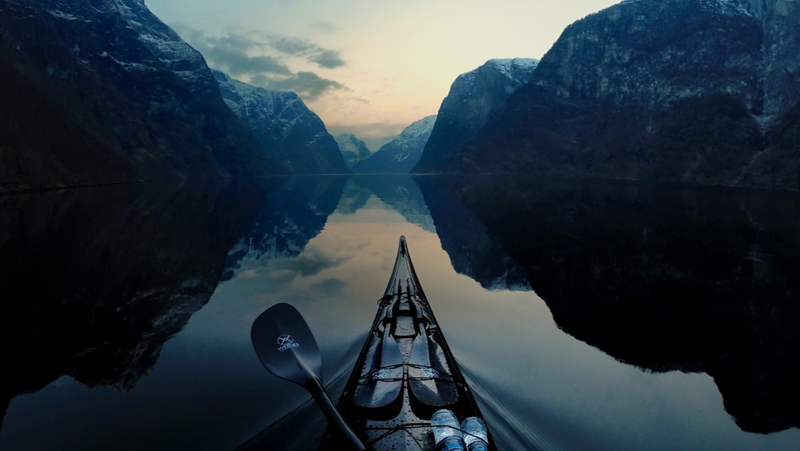 “Maybe this isn’t such a good idea,” I thought nervously as I wedged my paddle between two ottoman–sized icebergs. They were translucent–blue and among the smallest bergs jammed against my kayak–the largest was toward the bow and was more sofa-sized, to complete the living-room set. Ice and fiberglass scraped together as I drove my paddle between the bergs and rocked my boat from side to side, loosening the ice at my bow. Ahead, dense ice concealed the water for a half-mile, and behind me, more ice had engulfed an opening I’d used only 10 minutes earlier. But that wasn’t my main concern; I’d pushed through dense ice before. The big deal was the 200-foot-tall glacier about a quarter mile to my right–an uneven wall of blue and white ice about a mile long. For about a minute, ice had been falling from both sides of one of its giant pillars, smacking the water with reports like gunfire. The pillar–weighing thousands of tons–leaned precariously over the water. “It’s not so dense about a hundred yards to your left–if you can get there,” radioed my co-worker Malinda Lueck. She was a half-mile away at the edge of a cliff 350 feet above the water. I could barely see her small figure against a fjord wall that rose thousands of feet into soggy clouds. Just then, I heard a sharp crack. Turning quickly toward the glacier, I saw the skyscraper-sized pillar topple into the sea, sending an explosion of water and ice 150 feet into the air. The roar was terrifying as icebergs and 15-foot waves crashed against the granite shore bordering the glacier. Seconds later, another top-to-bottom section collapsed, echoing like a bomb blast against the surrounding mountains. I could only watch as the waves approached, giant wrinkles in icy water, and soon I was rising and falling eight feet, with bergs grinding against my boat. The entire mile-long fjord was alive with rolling waves and the sound of crackling icebergs. I am a kayak ranger. 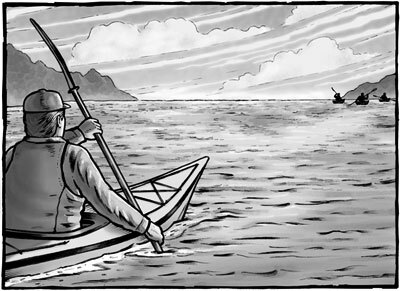 More accurately, I am a U.S. Forest Service wilderness ranger who happens to travel by sea kayak. I work in the Tongass National Forest, in one of southeast Alaska’s most spectacular wilderness areas, where high mountains covered in ice and snow rise directly from the sea, and three enormous glaciers flow to the ocean from the Canadian border. In southeast Alaska’s intimate blending of land and sea, I commonly encounter bears, mink, otter, humpbacks and orca while on the job. But those are just perks of the workplace. The actual job is monitoring and protecting parts of the national forest that are designated wilderness: lands managed to retain their pristine condition. Along with four other rangers, I work full-time for six months each year. For most of the season, we patrol the wilderness by sea kayak for nine-day stints–enough time to travel parts of the area’s extensive shoreline and contact widely dispersed visitors. After nine days, we spend one day at the office writing reports and maintaining gear, then take four days off to recuperate before the next outing. The Forest Service supports three kayak ranger crews in Alaska, with between two and six employees in each crew. They are the agency’s eyes and ears in Misty Fiords National Monument near Ketchikan, the Tracy Arm-Fords Terror Wilderness near Juneau, and the Nellie Juan-College Fjord Wilderness Study Area in Prince William Sound. But before you request an application, you should know that parts of southeast Alaska receive more than 200 inches of rain annually and that the mean temperature in July is a hypothermia-inducing 56°F. The ocean temperature is somewhere in the low 40s and much colder near the glaciers. Then consider the steep and rocky shores–difficult places to land a fully loaded sea kayak, particularly in pouring rain–and the nearly impenetrable rain forest that borders the sea. The conditions are inhospitable, to say the least. Kayak rangers tend to move from one project to another. Like most wilderness rangers, our crew is involved in a variety of projects that help us manage and understand our area, provide education and assist with research. For instance, Misty Fiords kayak rangers coordinate with botanists and biologists to survey flora and fauna and find rare species, creating a snapshot of southeast Alaska’s plant and wildlife communities. In Prince William Sound, kayak rangers have worked with the National Outdoor Leadership School (NOLS) and Alaska Pacific University to better understand the impact visitors have on popular campsites, which will guide management decisions. So what was I doing stuck in the ice? Prior to my run-in with the collapsing ice pillar, I had spent three days with two rangers camped a quarter-mile from a tidewater glacier in Tracy Arm, where we gathered data on harbor seals for the state wildlife agency and the University of Alaska Southeast. The data, including population counts and behavior trends, established baseline population estimates and may help explain the recent and sharp decline of seals in parts of Alaska. As I’d learned long ago, nothing is as simple as it sounds with this job. First, just arriving at “seal camp” was challenging. After kayaking 30 miles of narrow fjord–usually two eight-hour days including breaking and setting camp each day–we had to push through thick ice to a rocky bluff a quarter-mile from the glacier. Between calvings, which sent big waves crashing against the bluff, we landed our boats and carried our gear 40 feet up slippery crags to a lumpy ledge barely suitable for camping. Making camp–tying boats to boulders, setting tents, bear-proofing our food by hanging it from a cliff–consumed several hours, then we had to establish our research station, about 350 feet up the 5,000-foot mountain looming above camp. In light rain, we carried dry bags full of tarps, binoculars, spotting scopes, tripods and data forms up a series of steep cliffs covered in dense brush. At one point, we crossed an avalanche deposition from the past winter, strewn with the torn fur and mashed bones of an unlucky goat that had perished in one of the slides. At 350 feet, we reached an exposed ledge with a view straight down at the fjord, a mile-wide body of green ocean covered in icebergs ranging in size from hockey pucks to houses. In spring, more than a thousand seals congregate on the bergs to give birth to their pups. From 350 feet, they looked dark and sausage-shaped, but powerful binoculars provided close-up views without disturbing them. In the following days, we settled into a routine: After breakfast on the bluffs by camp, we hiked to the research station by 8A.M. and began hours of seal counts and observations. Although a glacial wind blowing cold showers made huddling under a tarp uncomfortable, southeast Alaska’s dynamic nature provided endless entertainment–the glacier released enormous calvings, occasional avalanches roared down nearby mountains and bald eagles flew low sorties over the ice pack looking for afterbirth or stillborn seal pups. Between 10 A.M. and 2 P.M. each day, up to 20 tour and pleasure boats entered the icy bay for a view of the glacier. Each afternoon, we hiked back to camp and cooked dinner close to the water. 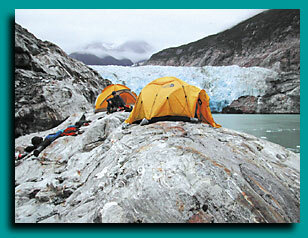 Steep cliffs prevented much hiking, so afterdinner, we watched the glacier, read or retreated to the tents if it rained. Sleep was fitful at best. Darkness didn’t arrive until after 11 P.M., the glacier calved loudly all night, and the arrival of light at 3:00 in the morning aroused a chorus of songbirds right outside the tents. Although the setting was spectacular, I was glad to leave seal camp on the fourth day for tamer surroundings and possibly some better sleep. Our other two rangers needed help removing an abandoned boat from a beach 30 miles away, so the next morning, I lowered my kayak down the bluffs, quickly loaded my gear, then launched on the frigid water. The Forest Service uses kayaks for a couple of reasons. First, they facilitate access to Alaska’s relentlessly steep shores, enabling rangers to land in nooks too steep and narrow even for skiffs. And kayaks can be hauled out of the water at night, whereas skiffs have to be anchored, often an impossibility in fjords hundreds of feet deep and filled with drifting ice. While non-motorized travel is consistent with wilderness management objectives, it can be dangerous in Alaska’s harsh elements, and the Forest Service holds its employees to the highest safety standards. For instance, in Juneau each ranger is trained in a variety of self- and assisted-rescue techniques, first in pools, then in Alaska’s frigid waters. While on the job, they are required to carry a marine radio, paddle float, bilge pump, spare paddle, towing system and PFDs equipped with survival kits that include flares, strobes, space blankets, knives and magnesium strikers. However, immersion suits are not required. Rangers go ashore frequently to inventory impacts, talk to campers and conduct other duties, and in the region’s constantly changing weather, such suits would be impractical. Instead, rangers always travel in pairs and are required to make radio contact with a dispatch office every 30 minutes while away from shore. Some programs even require carrying EPIRBs (emergency position-indicating radio beacons). 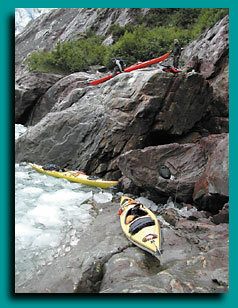 The downside to kayaks, of course, is that they are slow, especially against Alaska’s powerful tides, weather and ice. So occasionally we do use skiffs. 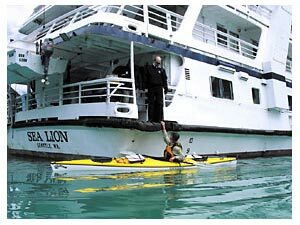 But with tour boats frequently visiting the area, kayak rangers near Juneau and Ketchikan have established a barter system with the tour operators and share their knowledge and experience in exchange for quick transportation. For instance, the morning I got stuck in the ice, I had an appointment with the MV Sea Lion, a 70-passenger vessel providing weeklong tours of southeast Alaska. As the waves from the calvings subsided, I found they had loosened the ice near my kayak, enabling me to paddle a mile through sporadic bergs to where the boat had stopped at the edge of another thick ice pack. Forty passengers in raincoats braved the drizzle and cold breeze on the boat’s bow, cameras ready for the next calving. But as I approached, steering around icebergs many times my size, they turned their attention to me. “Aren’t you cold?” one of the passengers called from the top deck, 40 feet above.“Where did you come from?” yelled another. We visit about 40 tour boats each summer, and the passengers usually react with the same surprise. I paddled to the boat’s stern, where the crew lowered a ladder and helped me aboard. After helping pull my kayak onto the rear deck, they led me inside and offered me hot chocolate. Before greeting the passengers, I hung my soaked rain gear near the ship’s galley and pulled my Forest Service shirt and hat from a dry bag I’d carried aboard. Although we usually wear sturdy rain gear, wool hats and synthetic layers while on the water, we carry clean uniform shirts for our more formal duties. In minutes, I had transformed from dripping kayaker to uniformed ranger. Education is an essential part of wilderness ranger projects and usually addresses minimizing physical and social impacts. However, the volume of tour boat passengers, Alaska’s spectacular scenery, and the fact that its two national forests are the nation’s largest provide kayak rangers a unique opportunity to educate on a broad range of topics. Shortly after I boarded the Sea Lion, the vessel began its 30-mile sailing back to Stephens Passage, where it would leave our wilderness for its next destination. The trip would take three hours, and along the way, we would pass between high mountains and hanging glaciers. For the first half-hour, passengers gathered in the lower lounge where I provided a talk about the Tongass, wilderness management and our specific projects. Afterward, I answered questions on a wide array of topics, including past and present cultures, natural history, logging and mining on the Tongass and specific wilderness issues. These wide-ranging discussions provide rare communication between the Forest Service and boat-based visitors to the Tongass, making the program popular with both the public and the agency. But the exchange also creates mutually beneficial dialogue between the Forest Service and tour operators. The topic of seals provides a good example: Ship naturalists receive current and accurate information about seals from rangers who help study them, and rangers have an opportunity to educate boat operators on low-impact ways of observing seals. Between visiting boats, rangers also visit campers to share their Leave No Trace (LNT) expertise and information about the area. 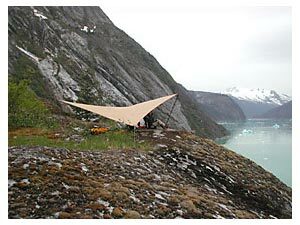 And in Whittier, Alaska, at the edge of Prince William Sound, rangers maintain an education yurt where kayakers and other boaters headed for the Nellie Juan-College Fjord area can find LNT, safety and logistical information. All three kayak ranger crews provide education in local communities by speaking to outdoor groups about LNT camping and wilderness management and helping train naturalists and kayak guides who bring visitors into the wilderness. After three hours, the Sea Lion powered down to drop me off in a large bay surrounded by mature rain forest and glaciated peaks that mark the wilderness boundary. A few dozen passengers leaned over the rails as I descended the ladder and settled into my kayak. They waved and took pictures as I backed away, turned with a broad sweep stroke and paddled south. Ten minutes later, I landed on a small island with lush rainforest growing right to its edges, the location of our primitive base camp. My co-workers Kevin and Jenny had arrived a few hours earlier, after paddling six miles from their last camp, and helped me carry my boat from the water. It’s not uncommon to see humpbacks during our travels, and they occasionally get pretty close. After lunch on the beach, we loaded rope, Pulaskis (axes with a hoe-like digging tool opposite the blade) and trash bags into our boats, then began a four-mile crossing to the mainland, where we would break apart an abandoned fiberglass skiff. Weather permitting, a barge would arrive the next day to haul the debris away. Like much of southeast Alaska’s Inside Passage, steep hills surround the bay, keeping its water flat and calm. Humpbacks sounded in the distance as we paddled, and the low clouds common to the region broke apart and clung to the mainland, creating fractured views of ocean, glaciers, forest and rocky peaks. Ninety minutes later, we arrived on a small beach overhung by green forest and dragged our boats over wet sand dotted with mink and bear tracks. At the head of the beach, a winter storm had driven the abandoned boat halfway into the forest. Our job was to break it into manageable pieces with our Pulaskis, then drag it closer to the water where the barge could winch it aboard. “We’re glorified janitors,” a former co-worker used to say of rangers. While education and research are more stimulating, removing garbage is an equally important part of our job. But it’s not always fun. We’ve had to remove plenty of soiled toilet paper from stream sides to protect fresh water sources, and we commonly pack out food scraps so bears don’t become accustomed to human food. We also find clothing, broken equipment and food wrappers and break apart fire rings in an effort to maintain unspoiled beaches for wildlife and campers. We spent two hours demolishing the boat and filling garbage bags with debris, then set up our camp just above the high tide line. After a big dinner of pasta with pesto, artichokes and Greek olives, we watched sea lions feed in a nearby kelp bed. As night slowly fell, wolves howled from the mountains behind our camp. The next morning, Kevin and Jenny would wait for the barge, then paddle 10 miles to visit a group of kayakers on a commercial tour of the area. My next assignment was a four-mile paddle toward the bay at Stephens Passage, where I’d catch a ride back to Juneau on another tour boat. That night, I would be relieved to be back in town, where eating out, sleeping indoors and listening to music would be welcome novelties. We spend five days in town after each trip. The first day is spent in the office writing reports, drying equipment and finalizing plans for the next trip, then we take a four-day weekend to enjoy civilization’s comforts. But as enjoyable as it is to sleep indoors and wear dry clothes, by the fifth day, we are usually itching to return to the field for the next trip. The work is always interesting and challenging, and the eagles, whales and tapping rain provide an unbeatable soundtrack to the workday. Applying for seasonal work with the Forest Service can be daunting at first, because of the lengthy application forms. However, determined applicants have an opportunity for rewarding jobs on some of the nation’s most spectacular public lands. However, specific positions are sometimes not described in detail on the website. Applicants can learn more about specific jobs by contacting Forest Service district offices in areas where they are interested in working. For instance, contacting the Juneau Ranger District (907-586-8800), the Ketchikan-Misty Fiords District (907-225-2148) or the Glacier Ranger District (907-783-3242) is a good way to learn about the availability of Alaskan kayak ranger positions. By January of each year, program managers usually have an idea of how many new employees are needed for the summer. Of course, competition is high for kayak ranger positions. But it often surprises applicants that kayak mastery is not highest on the list of qualifications. While kayaking and other outdoor skills are important, a passion for designated wilderness, public-speaking skills, and the desire to educate wide-ranging wilderness visitors are essential. And flexibility is essential. Rangers work in primitive conditions and challenging weather and are often paired with only one other person; patience and strong interpersonal skills are among the strongest assets an applicant can offer. The Forest Service’s thorough kayak training can prepare less-experienced paddlers for the job, but the other skills are often talents no training can provide. Upside-down in the chilly water, I crank my blade up to the surface, sweep it out to the side and hip snap to drive my upper body through the surface. Then I raise my head, stall and plunge back underwater–but not before filling my lungs with a big gulp of fresh air. Again I crank my blade to the surface, sweep, hip snap, raise my head, gulp air and–splash back seaward. It is my third failed roll and a carbon copy of the first two ragged attempts. I continue the process a fourth and a fifth time. I’m running out of breath as well as feeling the onset of an ice-cream headache. I gush, with all the enthusiasm of Tom Sawyer whitewashing a fence. “Now you try it!” My class of four floats around me in their kayaks, alternately nodding their heads in understanding and shaking them in disbelief: You want us to do what?! I can see I’ve piqued their interest, but no one is quite convinced to pick up a paintbrush just yet. The cass-a-roll drill, along with the other breath-holding exercises presented here, was designed to help students learn to relax after capsizing, whether they’re going to try a roll, as in this drill, or simply wet exit. Its purpose is to increase your tolerance for missing your roll, especially in a “combat roll” situation, when you’ve accidentally tipped over in rough seas. It’s a great confidence booster, and it really helps you learn to overcome the panic that often sets in after an unexpected capsize. As I’ve discovered from years of teaching, most paddlers tend to bail out after only a roll attempt or two. In small part, this is due to running out of air, but mostly it’s psychological: people simply panic. A missed roll washes away confidence. So the cass-a-roll drill is designed to help build confidence by practicing missing rolls on purpose, as many times as possible, before finally rolling up. If you usually wet exit after only one or two tries, you can train yourself fairly quickly to push it to three or four. Once you get up to four, it’s not that hard to build up to six or eight, or even more. After a bit more cajoling, I soon have everyone in class cass-a-rolling and practicing other confidence-building drills. Whatever your skill level–whether you’re just learning to roll, your roll is basically bombproof or you’re a non-roller just hoping to become more comfortable after a capsize–the following drills can help you learn to be more relaxed and comfortable, and ultimately more successful, when you find yourself upside-down in the drink. These drills are partly about training yourself to take deeper, bigger breaths and partly about teaching yourself to relax so you don’t burn that breath of air so quickly. I’ve modified several of them from practice drills used by competitive free divers, those freaks of nature who, through dedicated practice of breath-control techniques, are able to remain underwater for several minutes at a time (some of them diving to depths of 100 to 200 feet or more) with only a mask. My own meager training last year enabled me to double my breath-hold time after only a week of practicing the on-land drills, then nearly double that again until I began to plateau a week or so later. I was easily able to enjoy one- to two-minute bottom times and could push it to three minutes with some effort. I routinely dived to 30 or 40 feet and eventually reached a maximum depth of over 60 feet. I quickly saw the relevance for kayakers to train to relax and hang out underwater. The ability to take a quick, deep breath is a cornerstone skill to all the breath-hold drills presented here. While you sit reading this article, with each breath you are likely exchanging in the neighborhood of a mere 15 percent of total lung volume that’s typical of most humans. That’s less than a liter of your four-to-five-liter average capacity. Compared to the 90 percent exchange common among most marine mammals, it’s easy to see that we Homo sapiens are gross underachievers in this arena. Learning to boost that percentage closer to that of our fin-footed mammalian cousins, however–what I call orca breathing–is fairly simple and can quickly reap huge results. If you’ve ever heard orca whales breathe, you have a sense of how much air they move in and out of their lungs. There is this sudden huge whoosh of exhalation, followed immediately by a giant, equally sudden but less obvious in-rush of breath. Then they dive. The whole air exchange–again some 90 percent of their total volume–takes barely a second. Not bad for an animal with lungs about the size of your cockpit! With just a little practice, the benefits of orca breathing can be yours. The main difference is learning to do it quickly. First, take a couple of slow deep breaths. See how much air you can exhale, as if you were trying to blow out all 969 candles on Methuselah’s birthday cake. You might try bending over and even pressing on your stomach to squeeze out as many cc’s (cubic centimeters) as you can of that final liter in your lungs. Then breathe in slowly–the trick is to fill your lungs from the bottom up–by pushing your belly out first, then filling your chest, then finally doing what free divers refer to as “packing” your upper chest and neck area. When you have taken as big a breath as you can, raise your chin and extend your neck, and try “sipping” in a few more cc’s of oxygen through pursed lips, as if sipping up the last few drops of a milkshake through a straw. Take as many sips as you can, until you can’t fit any more air into your lungs. Then hold for a few seconds and focus on what it feels like to have your lungs so full of air. Repeat this exercise several times until you have a good sense of what a deep lungful of air feels like. But be careful–taking more than three deep breaths in succession can cause you to hyperventilate and pass out, which would be especially dangerous in the water. While practicing, remember to take a few normal breaths between each deep breath. Now it’s time for orca breathing. Unfortunately, in the context of rolling, we don’t have time for a full, slow, yoga breath. So imagine rolling up enough to get your head above water but missing your roll and quickly taking a big gulp of air in the second or two that you have before plunging back underwater. Think about trying to exhale on your way up, and take a big gulp as you stall, so that you don’t breathe in water on your way down. Start slower at first, maybe taking two seconds or so on both the exhale and the inhale. Eventually practice speeding it up to one second or so total. At the end of the “in” breath, hold for a few seconds, then try packing and sipping to see how much more air you can get in. With practice, you’ll soon find yourself consistently able to gulp from 60 to 90 percent of your lung volume, so that you have little space left for sipping in much more air. Now it’s time to move on to the next step. Static apnea is a fancy term for holding your breath while static, that is, sitting quietly relaxed on the sofa (or floating facedown in a pool of water as the competitive free divers do–the world record, by the way, is just over eight minutes!). Since kayakers don’t have the luxury of several minutes of deep breathing and meditation between rolls, the modification I practice involves single-breath holds, using orca breathing. Blow out and gasp in, doing a quick orca breath, and hold for five seconds. Repeat this orca breath and five-second hold five times (be careful to stop if you get dizzy; however, hyperventilation should not be a problem because you are holding your breath for several seconds each time and not taking more than one deep breath at a time). The next step is to try a series of five 10-second holds. Most beginners, I’ve found, can do this fairly comfortably with only a little practice. The next step is pyramid practice. This does not involve traveling to Egypt, but simply refers to increasing the length of breath holds to a peak, then reversing back down. For example, using one orca breath between each breath hold, hold for five seconds on the first breath, 10 seconds the next breath, 15 seconds the next, then back down to 10 seconds, then five and stop. When this becomes too easy, try double pyramids–hold twice at five seconds, twice at 10, twice at 15, then back down, twice each at 10 and five–and even triple pyramids. The point of pyramids is to build confidence by training to reach a peak well beyond the time you need for a roll. Then, as you descend back into the five- or 10-second breath-hold range, still well within the time limit for a typical roll, it’ll seem easy. But don’t wait until mastering triple pyramids before moving on to the next drills. Just spend five minutes or so to do four to eight pyramids. Start easy and build up to whatever level presents a comfortable challenge: if you attempt a double pyramid and can’t hold your breath twice at 15 seconds, just do one. You may be tempted to build up into the 20-second range or beyond, and such training certainly has value. But such times are well beyond the context of typical rolling times, and the longer you hold your breath, the more health risks are involved. While the shorter times I propose should be fairly safe, realize that serious free divers who routinely practice holding their breath for several minutes at a time occasionally develop heart arrhythmia. So as with any new exercise program, check with your physician first. And if you are serious about learning how to hold your breath for minutes at a time, consider taking a course taught by free-diving professionals. Instead of going for longer breath holds with static apnea, the next step in my progression is to get up off the couch and take the single-breath holds on the road. Dynamic apnea refers to holding your breath while exercising, and it’s much more relevant to kayakers. After all, you won’t be sitting on the sofa all “Zenned” out when you capsize. Walking pyramids is a dry-land, free-diver drill that is particularly effective for paddlers. Start walking at an easy pace. Now, instead of holding your breath for five seconds, take an orca breath and hold your breath for five steps. Take another orca breath and hold for 10 steps, breathe, hold for 15 steps and so on. Practice the same single, double and triple pyramid drills you used while sitting on the couch. Stop if you start feeling dizzy so you don’t fall and hurt yourself. Until you’re familiar with how your body responds to the exercises, you may want to practice on a lawn or other soft surface. While it isn’t that common to get dizzy and fall, it is a possibility. Once you are comfortable with the walking drills, it’s time to take to the water. It’s a good idea to practice paddling pyramids with a partner, particularly one who knows the Hand of God rescue (SK, June ‘00). While the likelihood of your passing out while practicing is slim, if you did manage to hyperventilate and pass out upside-down, you’ll want someone around who can quickly right your boat with you in it. Paddling pyramids are performed using the same progression as walking pyramids, only you count strokes instead of steps. A more advanced version of this drill for those with solid rolling skills is to actually roll at the end of each stroke count. That is, take an orca breath, paddle five strokes, roll; orca breath, 10 strokes, roll; orca breath, etc. When you can do triple paddling pyramids to 15 strokes with rolls in between, you are well on your way to becoming master of breath control, a near amphibious aqua-man or woman! A particularly challenging technique that can be applied to most of the drills here is the reverse breath hold, which refers to taking a big orca breath in, then blowing it out and doing a roll or pyramid practice, either sitting, walking or paddling. The idea is that you’re practicing after the out breath, with your lungs empty. With a little practice, you’ll be surprised at how long you can hold your breath when you don’t even have any breath to hold. One of my students dubbed the following drills (double roll, roll and hold, crash and roll) my “evil rolling drills” because she found them particularly challenging–more mentally than physically. Those who are learning to roll can practice them with a paddle float on the paddle to increase their breath-holding confidence without worrying about missing their rolls. A double roll is simply two rolls on the same breath hold. Take a breath and roll. Capsize again and roll up before taking another breath. The next steps, you guessed it, are the triple and quadruple rolls. With a little practice, it’s a good challenge for experienced rollers to do four to six rolls (or even more) off a single breath. Since each roll typically takes less than five seconds, the total breath-hold time is only 20 to 30 seconds for half a dozen rolls. A version of this drill that my students find particularly evil is doing reverse breath holds–breathing out–between double or triple rolls. This teaches you to remain calm and perform physically even if you aren’t able to get a good breath before going over. The roll-and-hold drill is a rolling pyramid drill. Capsize and count to five, roll up, orca breath, capsize and count to 10 (yes, that’s right, while upside-down under water). This is an extremely challenging drill in cold water. The ice cream headache will get you long before you get to your first 15, much less any double or triple pyramids! In a swimming pool or warm water, however, this drill can really help teach you to relax and take as much time as you need to set up to execute a nice, clean, unhurried roll. The crash and roll is a common bomb-proofing exercise where you sprint either forward or backward and lunge into a violent, splashing capsize, even letting go of your paddle with one hand. The idea is that you are trying to simulate a wipeout in rough water, instead of going over all ready and set up for a roll. While underwater, you have to reorient your paddle before setting up to roll. For a little extra challenge, how about trying a double crash and roll with a reverse breath hold? That is, paddle hard, breath out, crash and roll up twice before taking another breath! I developed this miss-on-purpose drill while teaching a friend named Cass to bombproof his combat roll. His roll was pretty consistent in the swimming pool, but once he got to the ocean, he tended to panic and rush his set up, causing his paddle to dive as he raised his head for air, no matter how many times I yelled “Head up last!” to him. This is a common problem I’ve seen when students take their pool roll out to sea. By learning to relax while missing your roll several times in succession–and training yourself to grab a quick orca breath between each attempt–you can dramatically increase your ability to remain calm under pressure. Instead of starting to freak out after missing a roll or two, you train yourself to get used to missing a half dozen or more. Practice this in a controlled situation with a buddy nearby for a bow recovery. Next time you go over in the real world, you won’t be so worried about running out of breath after only one or two attempts. I have two types of surf rolls I use to teach students to relax and roll in waves. The first is to capsize in the soup zone in front of a small wave and let it wash over you before rolling up. Try bigger and bigger waves as you get more comfortable, and try capsizing early, so you have to wait several seconds before the wave washes over you. The second version of this is to set up sideways to the waves and let one knock you over–just make sure you are in deep enough water that you don’t hit your head. And of course, you should always wear a helmet whenever paddling in surf. You can also practice surfing in and broaching on the wave, then window shading–that is, capsizing on purpose toward shore and having the breaking wave roll you several times–to re-create the typical surf-zone capsize. To teach himself to relax underwater, an instructor friend of mine invented arithmetic rolls. He would capsize with a dive mask and solve a simple algebra problem on a dive slate before rolling back up. If, like me, you’re more scared of algebra than of drowning, you might consider word puzzles or maybe a quick game of tic-tac-toe or hangman between partners. The point is to realize that rolling–and the ability to hold your breath calmly underwater–is as much a mind game as it is a physical skill. It has as much to do with training your body to perform with less oxygen as it does with learning to accept that your body can do without air for a lot longer than your panicky mind may think. And panic only burns oxygen faster. With daily practice of the dry-land drills, you should quickly see big improvements in your ability to comfortably hold your breath. Even two or three times a week should give noticeable results in a week or so. Once you are familiar with the various techniques, it’s easy to practice them throughout the day. I often play around with holding my breath while walking down the street, standing in line at the grocery store, wherever. I’ll hold my breath while working at the computer–write a sentence, orca breath, write two sentences, etc.–or even sitting at stoplights. On weekends (or whenever you paddle), try practicing paddling pyramids. I’ll at least do this even if I don’t feel like rolling and getting wet. But I usually do. I find the “evil rolling drills” challenging and fun, so I usually do end up wet and breathless before I land for the day. I’ve actually come to enjoy practicing these drills so much–along with the extra “bottom time” and confidence they’ve added to my already bomber rolling skills–that you might even say they’ve breathed new life into my rolling practice! A student of traditional kayaks discovers a piece of kayaking history in an Oslo museum and surveys one of the bamboo and canvas kayaks used in Fridtjof nansen’s legendary 1890’s expedition. While visiting friends in Norway, I discovered that Oslo’s Fram Museum was full of traditional kayaks. Of all the kayaks on display, there was one that I recognized. It was one of the canvas-and-bamboo kayaks used in 1895 by expedition leader Fridtjof Nansen and Fram crewmember Hjalmar Johansen in their attempt to reach the North Pole. I’d seen it before in an engraving of bamboo kayaks in Derek Hutchinson’s book, The Complete Book of Sea Kayaking, showing Nansen and Johansen in the kayaks lashed side by side, sailing the arctic waves. And there in the museum was one of the actual kayaks! I had no idea that any of these boats still existed. When I got home, I checked through all the books I knew of about kayak surveys and found no mention of the Fram kayaks. The only reference I could find was a web page by canoe, kayak and small-boat historian, Craig O’Donnell, who had reverse-engineered pictures of Nansen’s kayak into a set of plans. Even O’Donnell didn’t know whether or not the kayaks still existed. When Harvey Golden, a well-versed student of traditional kayaks, came to my town to talk about competing in the 2000 Greenland National Kayak Championship, I asked him about the bamboo kayaks. He had never heard of the Fram kayaks either, but he said someone should survey them before they aged further and deteriorated. A seed was planted in my mind. Six months after talking to Harvey, I found myself on a 767 to Copenhagen with a load of rulers, measuring tapes, calipers, fishing line, paper, pencils and an arm’s-length cardboard box full of 1 x 4s and canvas straps-my disassembled homemade kayak stands. I was to join my friend living in Lund, Sweden, head north by night train to stay with another friend who lived near the museum in Norway and survey some kayaks. I had spent time before leaving home devouring anything I could read by and about Nansen: Farthest North (Nansen’s book about his expedition to the North Pole, originally published in 1897), First Crossing of Greenland (Nansen’s 1890 book chronicling his crossing of the Greenland ice cap in 1888 by ski and sledge) and Eskimo Life (his observations on Greenland peoples and culture, published in 1891), as well as books on kayak surveying: John Brand’s The Little Kayak Book, 3 vols., and David Zimmerly’s Qayaq: Kayaks of Alaska and Siberia. After steeling my courage, I had faxed a letter to the Fram Museum asking if I could come study their kayak collection. I had expected to wait weeks or months for a reply, but when I answered the phone the next morning at breakfast, it was a long-distance call from Norway. A man from the museum, Mr. Berg, said he would be happy for me to come study their kayaks. After 10 hours on the plane, 20 minutes across the Øresund bridge to Sweden to pick up Josh, my surveying partner, and eight hours on the train north to Norway, I arrived jet-lagged and sleep deprived to meet my friend Elise who let us stay in her tiny apartment. Josh and I fortified ourselves with bowls of oatmeal and cups of tea and set off for the museum. In the Fram Museum, we found the bamboo kayak as well as a similar unidentified kayak that appeared to be a replica of the original kayak from the Farthest North expedition (Fram Museum no. 171) but built with a lumber frame instead of bamboo and covered in worn, painted canvas with six deck straps sewn on. There were also four Greenland kayaks and a gray canvas-covered folding kayak, with a long open cockpit bearing the label: “Faltboot Werke, Rosenheim Bayern,” its origin unknown to the museum. We could only spend five days in Oslo, so I quickly decided to document Fram Museum no. 171 and one of the Greenland kayaks (Fram Museum no. 176) that was built for one of Nansen’s colleagues following a crossing of the Greenland ice cap in 1888. Fridtjof Nansen was a Norwegian explorer who at age 27 led a team of five to be the first to cross the Greenland ice cap. Returning to Norway in 1889, he took a position at Christiana University as a professor of zoology, but his interests were not settled. He returned to exploration, leading the Fram expedition from 1893-96, crossing the then-uncharted Arctic Ocean. Although he wanted to continue exploring, his fame led him to be made Norway’s ambassador to Britain. He helped dissolve the union of Norway and Sweden in 1905 and later organized a relief effort for refugees and POWs from World War I, for which he was awarded the Nobel Peace Prize in 1922. After returning from the crossing of Greenland, Nansen had settled down into a house in Oslo, which he named Gothaab, to write about his recent experiences. On his wall, he hung the harpoon he used to hunt with in Greenland. Something about that harpoon always bothered him: Where did the wood come from that Greenlanders collected to make their tools? Despite the name, Greenland was mostly covered in ice with only seasonal vegetation that grew around the coasts. There were no trees there more than a couple of feet tall. Any wood there that had not been imported was driftwood. Nansen’s harpoon was made from a piece of straight-grained, reddish wood that had washed up on the shore, originally from a tree that had grown tall and straight on some other land. It could have come from anywhere that connected to the arctic seas; the tree might have fallen into a stream or river and flowed down into the sea to drift by a current and land finally on the shores of Greenland. An early indication of the origin of materials across the frozen polar sea came from the Jeanette, an American scientific ship that was trapped in the arctic ice north of Siberia in 1881. Despite all efforts to free her from the ice, she was crushed. Years later, a number of articles from the ship were found on the southwest coast of Greenland, evidence that there was a polar drift that might pass right through or very near the North Pole, from Siberia to Greenland. In 1892, Nansen decided to test his drift theory. He commissioned the building of the Fram, a ship designed to survive the crushing pressure of being trapped in the polar ice pack. It had an egg-shaped hull, reinforced oak construction and layers of insulation. The Fram and her crew sailed from Norway in 1893 to attempt to be the first to reach the North Pole. The plan was to sail to the polar pack ice north of Siberia, intentionally trap the Fram in the ice pack and follow the drift. Nansen estimated that it would take three years to come out on the other side in the waters near Greenland. Two years into the drift, all was going much better than expected. The crew, instead of starving or growing ill because of a deficiency in diet, were getting fat. Nansen, however, was bored. Despite the scientific accomplishments of the voyage, Nansen realized that they’d pass about 15 degrees shy of the North Pole. He made a bold decision: he would use the skills he had acquired in Greenland to try to reach the pole by ski and dog sledge. He would then make his way to a safe port using kayaks once he reached open water. He decided to travel with only one other companion, Hjalmar Johansen, a young crewmember fit enough to be up to the task. During the winter, the crew of the Fram built the sledges and the kayaks. The kayaks were bamboo framed, twine lashed and covered in canvas. They were loosely based on the Greenland design Nansen was familiar with, only shorter and wider. The kayaks’ short, wide, flat-bottomed hulls were not designed for speed but for cargo-carrying ability. With three deck hatches and deep hulls, they could carry three months’ worth of supplies and equipment for the two men and their dogs. The hulls were made for crossing open lanes in the ice and for paddling along the coasts of whatever land they’d reach, not for rough ocean passages. They were not agile like the kayak Nansen had used in Greenland, and it would be unlikely that Nansen or Johansen could recover from a capsize by executing a roll, as he had done before in Greenland. In March of 1895, the kayaks were mounted on the sledges and filled with provisions, and Nansen and Johansen set out for the North Pole. The museum removed Fram no. 171 from its display on the wall starboard to the giant display of the Fram and placed it down by the keel of the ship for us to work on. The museum indicated that the boat was Hjalmar Johansen’s kayak. We were told that Johansen’s kayak was originally housed at the Ski Museum in Oslo, which still holds the sister kayak used by Nansen as well as other artifacts from the expedition. I could confirm the identity of 171 by the depth-to-sheer measurement. Johansen’s boat was built deeper, 38 cm to Nansen’s 30 cm, to add more cargo space. The boat was a little crooked from pressure on the starboard stringer. The whole frame had shifted over to the port side, but because of the way the ribs were constructed, no ribs had broken and no lashings had parted. The canvas skin had a dirty, aged appearance and showed the damage and scrapes from the arctic ice and repairs done by Nansen and Johansen (patches and re-sewn seams). Otherwise the skin was in good condition. The skin is canvas, originally waterproofed by steeping it in a mixture of paraffin and tallow and later patched with oil paint and soot mixed with melted blubber. All this waterproofing made the kayak heavy. Nansen reported it to be 41 pounds with the skin accounting for 25 pounds of the weight. Three hatches in the deck gave access to the equipment stored inside. They were made by leaving a circular hole in the deck canvas with a loose tube of canvas cloth sewn to the perimeter of the hole. 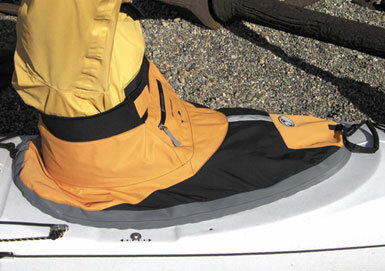 The hatch could be closed much like a dry bag: rolled or folded back onto itself and tied off with a cord. As the kayak rode high on the sea, water getting on deck and collecting into the hatches’ depressions would not have been much of an issue. Sticking my head inside, I found that the kayak was stinky and full of dust. It was easy to imagine the sweat, blood, blubber, grease, sea salt and soot that must have had their turn inside. For a kayak that had been through what Nansen and Johansen did to their kayaks and then aged more than a hundred years, Fram no. 171 had considerably little structural damage. There were no loose pieces inside. Some loose bamboo fibers fell out during the survey, and these were respectfully placed back in the kayak after we were done. 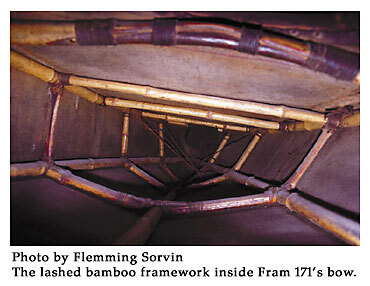 The bamboo frame lashed with cord was built using transverse frames holding the stringers instead of traditional ribs. Anyone familiar with George Dyson’s aluminum baidarka designs will recognize the structure. Most of the frame members are straight except the gunwales, the stringers and the one deck beam at the front of the cockpit. There are no mortises. The transverse frames are secured to the gunwales and the stringers by lashings going through a hole drilled in the rib (to keep its position) and wrapped around each side of the joint to hold it together. The only pieces of the frame that are not made of bamboo are the cockpit coaming and the bow and stern pieces. The coaming is made from a bent strip of 12 mm x 40 mm wood, joined by metal rivets, with three separated bone pieces of 5 mm x 12 mm x 23.5 mm making a sprayskirt lip. In keeping with Greenland style, it’s attached to the skin and not the frame. The bow piece is 44 cm long and is at 35 degrees from vertical. The stern is 40 cm long and at 22 degrees. There are a number of places where the bamboo broke and was repaired. Nansen wrote that at one point when they were sure of being close to open water, they stopped their march across the ice and took a few weeks to make their kayaks seaworthy again. They took the skins off and repaired any holes. Johansen’s frame had to be splinted a number of times on the gunwales and the stringers, which I was able to see in two places on the aft section. Because bamboo does not come in regular widths, as does sawn lumber, each piece of the frame is a slightly different size. Also, bamboo’s width is not uniform through its length. It grows in sections, each separated by a nodule ring and tapering in between. In spite of this, Fram no. 171’s members are of a fairly consistent size, and a fair generalization can be made as to the size in width of each piece. Exhibited with Fram no. 171 was the sledge used to haul the kayaks and their gear over the ice. I didn’t have time to survey it, although I wish I had. There was no paddle displayed with the kayak. Nansen reports using a canvas-bladed paddle lashed to a bamboo stick. There are no photographs, but I would guess that it was similar to one used by Nansen in Greenland when he built an improvised skin-on-frame rowboat to take him down the Ameralik fjord on the last stage of his crossing-a Y-fork supporting a canvas blade. These paddles were found to be too short for use when the two kayaks were lashed together side-by-side for long crossings. Improved paddles were made with shafts of bamboo snowshoe staffs lashed to blades made of broken-off wooden skis, which would look something like an improvised Greenland paddle. After months of travel against the southern drift, across pressure ridges and around lanes of open water and the occasional stretch of good ice, Nansen and Johansen reached 86° 14′ North, the farthest north reached by human beings at that time. They decided it was time to give up the bid for the North Pole and turn south before supplies and dogs ran out (they would kill their weakest dog to feed the rest, a gruesome business that haunted Nansen in the years that followed). They reached open water August 7, 1895, after five months on the ice and down to one sledge dog each. They had reached the sea near Franz Joseph Land, hundreds of miles from their intended target of Spitsbergen. Having dreamed of the ease of paddling instead of trudging over ice, they would still have to make a long crossing in a heavily laden, flat-bottomed boat not designed for the open ocean. Their solution was to lash the kayaks together catamaran-style with their skis through the deck straps as support and their sledges and two remaining dogs on the deck as cargo. They could only paddle on one side of each kayak, but they soon had a following wind and found that the sail they had carried for pushing their sledges across the ice worked just as well for their little watercraft. Winter was approaching, so they found a suitable island where they built a stone-and-moss hut and survived on polar bear and walrus meat. Their plan was to stay until spring, then sail through the Franz Joseph archipelago to the westernmost point and make the open crossing of 140 nautical miles to Spitsbergen, where there was sure to be a Norwegian whaler that could take them home. Up until this point, they had made much smaller open-water crossings from island to island of no more than a day and usually along the edge of ice where they could camp at night. To stay and wait meant hoping the Fram would make it out of the ice soon enough that their supplies wouldn’t run out and that rescue would find them. Besides that, waiting was not in their character. To go south across the Barents Sea to northern Russia meant a longer crossing and a long walk home. Spitzbergen was the closest Norwegian territory. One day during their voyage westward through the remaining Franz Joseph islands, Nansen heard dogs barking while he was breaking camp. He went to investigate and encountered a British man, clothed in fine wool and smelling of soap. The man was part of a British scientific party that had a ship coming for them sometime that summer. Despite the comfort of clean clothes and a warm hut and coffee for both Nansen and Johansen, they were eager to sail south. Over the next few weeks in the company of the Brits, Nansen still considered trying for Spitsbergen in the kayaks. Luckily, the ship finally arrived and took him and Johansen and their kayaks and sledges back to Norway. Remarkably, eight days later, the Fram arrived at Skjærvø, Norway, after having been freed from the ice only six days before. After almost a year apart, Nansen reunited with his crew and sailed home to Oslo. The Fram was used twice more: in 1898 to explore the northern tip of Greenland and in 1910 to springboard Roald Amundsen’s expedition to the South Pole, which makes it the ship that has sailed the farthest north and south on the surface of the Earth. In 1936, it was preserved for posterity in the A-framed museum where it currently rests. It seems incredible today that a pair of canvas and bamboo kayaks of Fram no. 171’s design would perform well in harsh arctic conditions. They had a couple of things going for them-they were short and wide, which enabled them to carry a large amount of cargo, and the design was flexible enough that it could be transported on sledge over ice, paddled across calm water lanes in the ice, lashed together and sailed over longer stretches and last over a year’s hard use. Although the frames and skin were damaged, they were repairable with simple materials and tools, such as splints and cord for the frame and soot and blubber grease to seal the canvas. Even when disasters occurred, like a walrus spearing holes through the deck of Nansen’s kayak or a gunshot accidentally piercing the hull (narrowly missing Nansen’s legs), the kayak could be repaired, usually in hours, and they could continue. The design’s simplicity paid off. What better endorsement is there for the usefulness of good old canvas on a hand-lashed frame? Our three forward-stroke experts have spent years refining their individual stroke techniques. Using these tips, you can benefit from their experience and learn to develop the ideal forward stroke. The forward stroke is so basic, so intuitively simple, that just about anyone can hop in a boat and have it moving forward in a matter of minutes, if not seconds, with no instruction whatsoever. Developing an efficient forward stroke, however, or any degree of “mastery,” can be a lifelong project. Indeed, serious competitive paddlers typically spend their entire careers focusing on perfecting the elusive “ideal” stroke. But an efficient forward stroke is not necessarily just for dedicated racers. As the following three forward-stroke experts point out, recreational kayakers can reap countless benefits from refining their forward strokes. The first of our contributors, Olympic kayaking medalist Greg Barton, believes that even the most relaxed recreational paddlers can cut years of trial and error off of developing efficient stroke technique by learning a “racing stroke,” then modifying it to suit their touring needs and the sea conditions. Our third and final author, sea kayak instructor Dan Lewis, is, like many recreational paddlers, admittedly more concerned with scenery than with speed. He believes that developing both an “effortless” low-angle touring stroke as well as a powerful, high-angle racing-style stroke allows him to choose a stroke style that matches the conditions. As a serious recreational paddler and an American Canoe Association kayak instructor trainer, I have been a longtime student of forward-stroke technique. Whether I’m working with beginners or other instructors, I start with the foundation of the modern racing stroke, then dial it down to meet my needs or those of my students. Whether you are out to win races or just beat the afternoon wind back to camp, the following advice on technique should give you plenty to work on. Starting with Greg’s high-angle, high-performance racing stroke and working our way to Dan’s low-profile touring stroke seemed a natural progression for this article. There are more similarities in the writers’ contributions than not. Common themes include using torso rotation to involve the larger muscles of your back, upright posture, ending the stroke as your hand reaches your hip and a relaxed grip. The differences may seem subtle to many paddlers: how far apart to space your grip on the paddle shaft, whether to cross the centerline with your top hand or not, how high to hold your top hand, how much to bend your elbows, and so on. While trivial to those not as well versed (or obsessed) with the finer points of stroke mechanics, such differences have created a personal style that works for each of the writers and can help set you on the path to developing a style that best suits your needs. There are a number of things a paddler can do to move faster. But if a paddler starts to fall to the rear of the pack, it’s the group’s responsibility to make sure that person isn’t struggling to keep up. In the Netherlands, “carrying the red lantern” is an expression used to describe someone at the back—the last person in the group. How many times have you paddled in a group that had a slow paddler lagging behind? Were you ever that paddler? How did it feel? If you are reading this, you probably didn’t stop paddling because of it. But you might have thought of giving up kayaking if the groups you paddled with consistently ignored you and left you in the unenviable position of bringing up the rear. When I started paddling, I always seemed to have trouble keeping up with the group. I thought I was the root of the problem and that I probably wasn’t cut out to be a kayaker. I focused on my “inability” — too little skill, experience, stamina and strength. I was frequently frustrated and paddled to the brink of exhaustion trying to keep up. I even ordered a new “fast” sea kayak, hoping it would make a difference. It didn’t. I progressed slowly, and over time, my technique improved. I grew to be a stronger paddler. I remember well the day I could paddle from the back of the pack up to the front paddler to say hello. But my early experiences did not have to be so difficult and discouraging. There are a number of things a paddler can do to move faster. But if a paddler starts to fall to the rear of the pack, it’s really the group’s responsibility to make sure that person isn’t struggling to keep up. A group of kayakers is only as fast as its slowest paddler. In my early years of sea kayaking, there were a few considerate paddlers in my group who kept me company. And yes, the group waited every now and then for me to catch up. But the moment I drew even with them, they would immediately start paddling again. Most of them had had time to rest, drink and eat a snack while waiting for me. The other paddlers may have thought I was doing fine, but because they started moving again as soon as I caught up, I never got a break. I was too proud to speak up and kept paddling at the limits of my endurance. Nobody wants to be left behind. If it is inability that puts a paddler at the back in the first place, no amount of effort will help that person keep up consistently. That paddler may resort to muscle power with less attention to forward paddling technique. The paddler becomes inefficient or tense or, even worse, gets exhausted and paddles even more slowly. One of the quickest and most effective solutions for the person “carrying the red lantern” is for the group to put the slowest paddler in front to determine the paddling speed of the whole group. If the trip is planned around this estimated paddling speed, there is no reason for anyone in the group to go any faster. This removes the pressure to go fast and lets the paddler in front concentrate on efficient, relaxed paddling. I’ve often observed that the person stationed at the front of a group paddles faster than when paddling at the rear. And that even holds true for myself! If you are in a group that is moving slower than you’d like, be supportive of the paddler who is not “up to speed” on that trip. Your patience and support will create a positive learning experience that will encourage the paddler to embark on future trips. It’s also important to be honest, especially when putting a group together for a trip. Novice paddlers must be aware or made aware of their skill level and abilities relative to the standards needed for the trips they would like to undertake. What is just an ordinary trip for you can be a challenge for someone less able. In waves, novice paddlers or, more generally speaking, paddlers outside their comfort zone tend to focus more on stability than on forward speed. Paddlers feeling uncomfortable in rough water will often use wider sweep strokes to augment their stability, which offer less-efficient forward progress. Also, when paddlers are anxious, their performance suffers. If possible, offer a route around patches of rough water. Use a buddy system. An experienced paddler offering encouragement can do much to help keep feelings of panic and anxiety in check and be in a position to offer assistance if necessary. Prior to paddling into rough water, the trip leader can reduce the build-up of anxiety by explaining the best approach to keeping the group together and who will be paired up. This briefing should take place before launching or, at the latest, well before entering rough water. For most experienced sea kayakers, a following sea provides a “free” ride. Paddlers who are adept at surfing on wind waves can cover distance very quickly. Taking advantage of waves requires short bursts of high energy and quick paddle techniques. A paddler who can’t or doesn’t know how to surf will soon be well behind. If the paddlers are surfing waves that come at an angle to the group’s course, they may follow a zigzag course to get the best rides on the waves. The person at the rear of the group may become frustrated by the frequent and seemingly random course changes and may not know which direction to paddle. This paddler might make frequent course adjustments that deter from forward paddling and the most direct path to the goal. The paddlers who are not surfing should maintain a consistent heading. Those surfing should drop back from the group before catching waves and pull up before getting ahead. That way, they can keep the group from spreading out too much. The trip leader can also do a better job at the back, overseeing the whole group and spotting paddlers who may have trouble. You can control weathercocking—the tendency of a kayak to veer off course because of the wind—by the weight distribution of your gear stowed in the front and aft hatches. If you ever have the opportunity to help someone with this trick, you’ll be considered a miracle worker. Of course, this technique should only be used when you can safely open the hatch. While paddling in crosswinds, a paddler can use up a lot of energy trying to keep a sea kayak on course. If the rudder, skeg or changing trim can’t solve the problem, setting up a course-holding tow may be the best option. Offer the tow well before the struggling paddler gets exhausted. A course-holding tow is more effective when the paddler being towed hasn’t been pushed to exhaustion—if the towed paddler can make some forward progress, the towline will be slack most of the time, with only an occasional tug needed to bring the paddler back on course. With any tow, a second buddy should paddle back and to the side of the towed paddler to offer assistance if needed. Clearing the surf zone at the start of a trip can use up a lot of energy, putting paddlers with less strength at an early disadvantage. For some, the drain of energy can start even earlier with carrying the sea kayaks to the beach. I like to take at least half an hour to recover after hauling kayaks to the water. Allow for delays when choosing a departure time. Capsizing and re-launching also eat away time and energy. Pushing paddlers off the beach is good for conserving their energy, but don’t make a routine of it. Providing a boost does not make less-experienced paddlers proficient in launching on their own. Make sure novices take the time to check for wave sets, and coach them through the surf. The experienced paddlers will probably get through the surf with minimum effort, so when everyone has gathered outside of the surf zone, start paddling easy. There will already be a separation between fit and tired paddlers. Many trips will start from a sheltered put-in but will head for a less protected destination. Paddlers who seem quite capable at the launch site may not be up to handling the surf zone on an exposed shore. If for some reason your group must land through surf, then carefully estimate the surf height. Anything higher than two feet should be considered big surf. Beaches subject to regular dumping surf should be off-limits for trips involving groups of paddlers with mixed abilities. The standard procedure in sea kayaking is to send in the most experienced paddler first. When you have other experienced paddlers in your group, pair them up with less experienced paddlers. I often see paddlers stay in the surf zone way too long, despite executing exactly what they were taught. Although they back-paddle to let waves break in front of them, overall progress is rather slow. There is often too much time and chance for that big ugly wave to arrive. The more experienced paddlers could give their buddies instructions on when to paddle hard, wait or back-paddle. Before deciding to land for a break, the trip leader should be certain that everyone in the group is fit and capable of the landing and subsequent launching. A lot of time and energy can be spent in the surf zone. Everyone in the group must have enough energy left to paddle back to the put-in. If some paddlers are already getting tired, it may be the wiser choice to raft-up out at sea for a break. So far, it might sound like the difference in skill or experience determines if someone is able to keep up with the group. But even when you are among “equals,” a paddler may still fall off the group’s pace. For some, it is very difficult to admit to not feeling fit or strong enough for the challenge ahead. If you are having doubts about your condition, it is important to speak up before setting out. It is much more embarrassing and risky if you have to fess up halfway into a long crossing. It is not unusual for a tired or hypothermic paddler to grow quiet, so everyone in the group should keep an eye on each other, just in case.In rough conditions, some paddlers may not be comfortable pausing to eat and drink. Considerate paddlers should regularly check to see if their companions need to raft up for a refreshment break. Experienced paddlers who are comfortably stable in their boats will be able to relax and rest while they set their paddle on their spray deck or in a paddle park. Those who feel unsteady will keep using their paddle for bracing, burning up energy on balancing even if they are not moving forward. For them, there is never a rest in rough water. Most of the time, it is very easy to tell when a paddler is struggling to keep up. If you’ve set a fast pace and gone without breaks or if the wind picks up and conditions get rough, check to see if the group has spread out and some paddlers have fallen behind. If so, it is time to gather the group around the trailing paddler. If an exhausted paddler is no longer able to paddle independently, a rafted tow is needed. Having to accept a tow can be an embarrassing situation for some paddlers, especially more experienced ones. They often feel that they have failed, although in fact, it is the group that has failed. And depending on the conditions, the whole group could be in danger. It is difficult to decide when to tow a paddler who is not yet exhausted. If weather or tidal conditions are deteriorating, swift action should be taken. If the need for a tow is explained clearly, the paddler in question will usually understand the need and readily agree to accept the tow. Exhaustion can induce hypothermia and vice versa. When energy reserves are low because of exhaustion, there might not be enough energy left to warm the body. It’s a good idea to keep an exhausted paddler warmly dressed during towing. In a rafted tow, the buddy who has stopped paddling to raft up and steady someone’s kayak might become cold due to lack of activity. It is best to take care of tiring paddlers quickly before they get to the point of requiring a great deal of assistance from others in the group. At that stage, the progress of the whole group is impeded even more. Strong paddlers might get frustrated if they have to maintain a slower pace or paddling cadence. They might even complain of being cold because they’re paddling too slowly. Depending on their attitude, faster paddlers can use this time to socialize, navigate, work on skills, take pictures, be a considerate paddler and trusted buddy and become a competent trip leader. The most experienced paddlers can take turns being the “shepherd” roaming around the group. They’ll get plenty of exercise by paddling from the back of the pack to the front paddler. If the fast paddlers put their energy to good use while staying close to the group, it creates a setting that takes the pressure off the less-experienced paddlers, allowing them to improve rapidly. A trip starts when the last paddler is on the water and ends when the last paddler is off the water. Obviously that last paddler should never consistently be the same person. This is a bit of an oversimplification, as a trip really starts even before getting on the water and probably only ends after debriefing. But by being aware of the paddler carrying the red lantern, the red flag signaling trouble may not need to be raised. Over the last 10 years, the standard wardrobe and gear needs of most kayakers have shifted from functional, basic essentials to high-tech, often flashy items created from space-age fabrics and composite materials. In the midst of all this glamour, the humble spray skirt, for the most part, has changed little. Its basic design, constructed of neoprene or some variation of coated nylon, has remained fairly consistent throughout the last decade. Times, however, are changing. The spray skirt’s day in the limelight has finally arrived. Though their primary purpose remains the same, many of today’s spray skirts exhibit a trend toward new fabrics, special features and increased functionality. The products in this review provide good examples of that trend. In testing the following six spray skirts, I wanted to examine how well they performed their primary purpose—keeping water out of the cockpit. The fit and seal of a spray skirt around the cockpit coaming is a critical safety aspect for kayakers. It is essential that the spray skirt is the right size for the kayak it will be used on. There is no substitution for trying a skirt on the kayak you intend to use to ensure proper fit. Also of importance is how challenging it is to get the skirt attached to and released from the coaming. You want the spray skirt to seal well enough to keep the water out but be easy to release with one hand. If the seal around the coaming is too tight, the skirt may not release easily during a wet exit; if it’s too loose, the paddler will have a cockpit full of water in no time, adversely affecting the kayak’s stability. 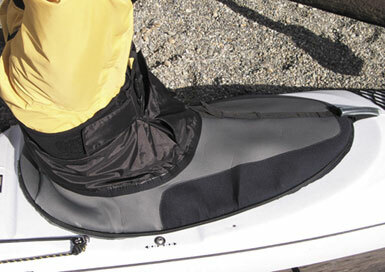 Another important aspect of a secure spray skirt pertains to the seal around the paddler’s waist, known as the tunnel. A number of factors can impact this seal, including the type of fabric, the type of closure or tightening system and, of course, the shape and size of the paddler. In addition to testing the primary functions of these spray skirts, I wanted to see how well the various features performed, such as pockets, secondary release systems and other extras, and how well the features met the claims made by the manufacturers. 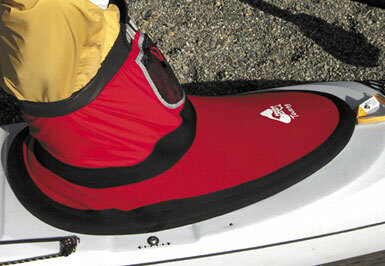 The spray skirts reviewed here were tested on both a fiberglass kayak and a plastic kayak. Bomber Gear’s Tour de Jour is made from a waterproof, breathable three-ply fabric. The spray deck is sewn to a rand (a sleeve of fabric sewn to the perimeter of the spray deck) made from a sticky rubber fabric. All seams except where the rand and spray deck meet are sewn and made waterproof with heat-sealed tape. A length of elastic cord is routed through the sleeve and knotted at the back of the skirt. Although the elastic cord allowed the tension of the spray deck to be adjusted, the knot interfered with getting the skirt over both the fiberglass and plastic kayaks’ coaming. It was only slightly difficult to attach it to the fiberglass coaming but notably difficult to get it started on the plastic coaming. At the top of the tunnel, a three-inch-wide band of smooth neoprene is attached around the perimeter. This provides a sticky seal that is complemented by two hook-and-loop cinch tabs that pull forward to tighten the seal. The system worked well and stayed put once it was in place. The Tour de Jour has a strip of plastic inserted in a fabric sleeve that is flexed by a strip under the deck into an arch to prevent water from pooling on the deck. The system worked very well—water quickly ran off the spray deck. A band of reflective tape on the spray deck provides enhanced nighttime visibility. On the front of the tunnel, there is a zippered self-draining outer pocket. Inside, there is another pocket, just big enough for a small wallet, which has a roll-down dry-bag-type closure. I found the dry pocket to be too small to be convenient while afloat, but it does provide a place for ID, a bit of cash and car keys. For those who don’t want to bother with wrestling the spray skirt on and off the coaming every time they want to reach inside the cockpit, Brooks Wetsuits offers the Zippered Neoprene Touring Spray Skirt. Featuring a 3.5mm neoprene spray deck that is heavily reinforced with Duratex fabric over the entire deck, this skirt feels durable. The tunnel features stretch nylon inside and out that offers an extra layer of warmth. The perimeter of the spray deck is folded over and sewn, creating a sleeve for an elastic cord. This seals around the kayak coaming and is adjustable via a knot in the back. Brooks has added a short plastic spacer that holds the knot away from the coaming edge so it doesn’t interfere with attaching the skirt at the back of the coaming. The Zippered Touring Skirt could be stretched over a fiberglass coaming with moderate ease but with moderate difficulty on the more slippery plastic coaming. Once in place, the spray skirt was secure on both. Two adjustable waist straps, one sewn onto each side of the skirt tunnel, ensure that the Zippered Neoprene Touring Spray Skirt stays secure and snug around the paddler’s waist. The system worked well and provided a good seal around my waist, but I found reaching back to the straps and buckles a bit awkward. Though this skirt does not have any pockets, its zipper feature allowed easy access to the inside of the cockpit without removing the spray skirt from around the coaming. A heavy-duty, waterproof zipper, the same kind as are used in dry suits, runs from the top of the tunnel down the front of the spray deck and stops a few inches short of the grab loop. The zipper ends at the top of the tunnel, so unzipping the skirt usually requires opening a life jacket and lifting any apparel that may be covering the tunnel of the skirt. Although the zipper allowed easy access to the inside of my cockpit, I found that it was just as easy to pull the front of the spray skirt off if I wanted cockpit access. Where the zipper did provide a significant benefit was getting in and out of the spray skirt. A neoprene spray skirt with a snug tunnel can be a struggle to pull on over a wetsuit, especially for those with wider hips and a narrow waist. The zipper made it a breeze. I just unzipped, pulled the skirt up around my waist and zipped it up. As with most dry suit zippers, this one needs to be kept clean and lubricated to operate smoothly (Brooks supplies a stick of zipper lubricant with the skirt). Without it, the zipper can get very stiff and difficult to use. Kokatat’s Offshore Deluxe Sea Skirt has a deck of 3mm neoprene, reinforced for durability with a rubber coating on the inside and on the outside along the forward edges of the coaming. Attached to the deck is a 4-oz. coated-nylon tunnel. All seams, nylon and neoprene, are sealed on the inside. The seal around the coaming is secured with bungee cord externally stitched around the perimeter of the spray skirt. Getting this spray skirt attached to a fiberglass coaming is moderately easy, requiring that you make sure the back of the skirt strap is anchored while you pull the spray deck forward. Getting it started on a plastic coaming was much more difficult because the back of the spray deck doesn’t have enough contour to hook around the plastic coaming and stay in place. Once fully attached on either coaming, the spray skirt had a secure fit yet released with relative ease. The seal around the waist is achieved through a wide band of smooth-skin neoprene along the top edge of the nylon tunnel. Smooth-skin neoprene has an especially sticky characteristic that helps prevent the tunnel from slipping down. The neoprene band is tightened around the torso by a pair of tabs with wide hook-and-loop patches. Cinching each tab back along the side of the skirt tunnel snugs the tunnel into place. Once I had it in place, the tunnel did not slip down around my waist, although tightening it would have been easier if the tabs were attached so that they pulled from back to front instead of front to back. The tunnel is further supported by adjustable suspenders with stretch webbing. The suspenders are removable for wearing the spray skirt layered under paddle tops or dry suits with overskirts. Kokatat has included a self-draining, zippered pocket at the front of the tunnel. The pocket is ample in size for a pair of gloves or a set of flares and a couple of energy bars. It has a zipper pull that was big enough for me to grasp while wearing gloves. Behind the cargo pocket is a fleece-lined hand-warming pouch. Along the center of the spray deck, Kokatat has sewn a length of one-inch nylon webbing, which has two unsewn spans that provide places to clip gear, such as a GPS on a lanyard. I found this feature quite useful, as I often like to secure gear right in front of me—not up on the foredeck of the kayak. A second piece of webbing with strips of hook and loop sewn on it provides a way to secure a paddle or other gear quickly, if temporarily. Kokatat offers this spray skirt in the nylon/neoprene configuration reviewed here. The spray deck of the Mountain Surf spray skirt is made from durable 4mm neoprene laminated between two layers of nylon stretch fabric. The deck is sewn and taped to a tunnel made of Aqualogic, a tough, breathable, waterproof fabric. The skirt looks both functional and durable. At the edge of the spray deck, the rand is formed by a separate strip of neoprene attached around the perimeter of the spray deck. Inside the edge of neoprene is a strong O-ring of solid rubber, unlike the multi-filament bungee cords commonly used on other spray skirts, that provides the tension on the seal of the coaming. Mountain Surf provides the O-rings in two different degrees of tension: E-Z fit or, for more extreme conditions, the Bomber Fit. The E-Z fit model tested was easy to attach and remove, and it fit and held exceptionally well around the coaming. At the top of the tunnel, a two-inch-wide band of smooth neoprene is folded over and sewn around the top perimeter, creating a sleeve for the skirt’s quick-release chest belt. I found the system easy to use, and although it slipped down around my waist a little while paddling, it tended to stay in place. A handy mesh pocket, large enough for a few pocket flares or energy bars, is attached to the front of the tunnel. Its zipper has a pull that can easily be grasped with wet or gloved hands. Prijon/Wildwasser offers the versatile Pocket-System Neo/Neo touring spray skirt. Simple in design, the forward edge of the spray deck is neoprene, faced with an abrasion- and UV-resistant Supratex weave designed to resist the wear caused by a paddle rubbing against the coaming. The transition from the spray deck to the tunnel creates a tent-shaped sloping surface that sheds water easily. This is different from most spray skirts, where the nearly vertical tunnel is a tube sewn onto a flat spray deck. An elastic cord is sewn to the outside perimeter of the spray deck, but it doesn’t curl the edge of the spray deck enough to hook around the cockpit coaming and anchor the back of the spray skirt while you stretch it forward. The comparatively flat perimeter of this spray deck made it somewhat difficult for me to attach it on the fiberglass coaming, and I needed help to install it on the plastic coaming. Like some whitewater spray skirts, the Pocket-System Neo/Neo doesn’t have a belt of hook-and-loop tabs to adjust the fit around the paddler’s torso. 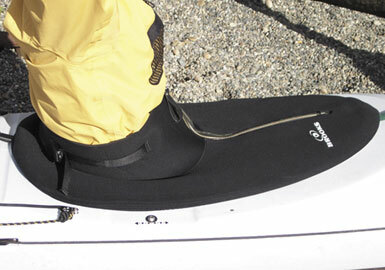 Instead, the neoprene stretches to fit a girth from 30 to about 40 inches. (Keep in mind that it gets tighter the farther it stretches.) For me, the stretch fit worked well on the water, creating a good seal around the waist and adding another layer for warmth. The pocket feature of the Pocket-System Neo/Neo is a large mesh pocket sewn onto the forward portion of the spray deck. Unlike accessing a pocket sewn into the spray-skirt tunnel, which may require unzipping your life jacket, this pocket is easily accessible through a large zippered opening that faces toward the tunnel and is big enough to hold full-sized binoculars or a double-handful of miscellaneous items. This spray skirt is also available with a breathable fabric tunnel and suspenders for additional cost. Snap Dragon introduced the Glacier Trek EZ as a new skirt for 2003. The spray deck on this skirt is a heavy-duty, 3.5mm, four-way-stretch neoprene. Attached to the deck is a tunnel made of breathable, waterproof Sympatex fabric, providing a cooler core area than a neoprene tunnel without the moisture-trapping properties of coated nylon. Snap Dragon has perfected the shape of the seal around the coaming. On this spray skirt, the bungee is sewn to the edge of the spray deck. The neoprene deck is gathered as it is sewn, creating a slight curl that makes this skirt considerably easier to install over the coaming. It was very easy to install over the fiberglass coaming but, like most spray skirts, was a bit slippery getting started on the coaming of the plastic kayak. Once in place, this spray skirt fit both cockpits exceptionally well. Around the waist area of the skirt, the top of the Sympatex tunnel is rimmed with a four-inch band of neoprene. 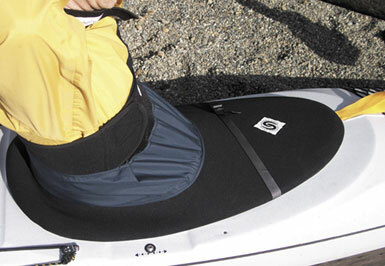 Hook-and-loop fabric tabs are used to cinch the tunnel around the waist of the paddler. The tabs of hook fabric are at the side of the tunnel and pull forward to secure on the loop fabric sewn on the front of the tunnel. The system was simple to use, and it kept the skirt securely in place around my waist. The Glacier Trek EZ lacks elaborate features, but it does have a great safety feature—the Knee-Off safety strap. A single length of flat webbing extends across the top of the spray deck and fastens to the rand at each side of the spray deck. If the standard grab loop fails or gets inadvertently tucked under the forward edge of the spray skirt, pulling the Knee-Off safety strap releases the spray deck at the sides of the coaming. Its name, it should be pointed out, refers to its location above the knee, while the principal way of using it is to pull it by hand. On some plastic kayaks, that may be enough to completely release the spray skirt. On the fiberglass kayak used for testing, the skirt did not come completely free of the coaming, but it pulled the edge of the skirt to the point where it was easy to grab and remove. The Knee-Off strap is an optional feature that adds about $8 to the retail price. Except for the PFD, a kayaker’s most basic piece of safety equipment may be the hand-held, hand-operated bilge pump. The hand bilge pump serves its purpose in most situations: practicing rescues, pumping out seepage after practicing rolls or, more rarely, while rafted up with another kayaker during a real rescue. However, if you have to use it while paddling solo in rough weather, you will quickly become aware that it has two fairly serious shortcomings: You can’t seal the spray skirt, and you can’t keep both hands on the paddle while pumping. If you go out paddling alone, which many kayakers do at least occasionally, you have an obligation, both to yourself and to any others whomight come to your assistance if you get into trouble, to be as self-sufficient as possible. The bulkhead-mounted foot-operated bilge pump resolves both of the hand bilge pump’s shortcomings: You can keep your spray skirt sealed and both hands on the paddle while pumping out your cockpit. With basic mechanical skills, a few simple hand tools and a few hours of your time, you can install a foot-operated bilge pump for around a hundred dollars. There are two additional options when it comes to hand bilge pumps, but in my opinion, both of these have drawbacks. 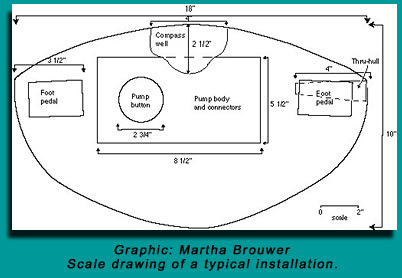 For about the same cost as a foot pump, and probably with much less work, you can install a battery-powered electric bilge pump (see SK, Aug. ’99). However, electric pumps require users to ensure that the batteries are charged before each trip and that the entire electrical system—pump, switch and batteries—is kept completely dry and free of corrosion. 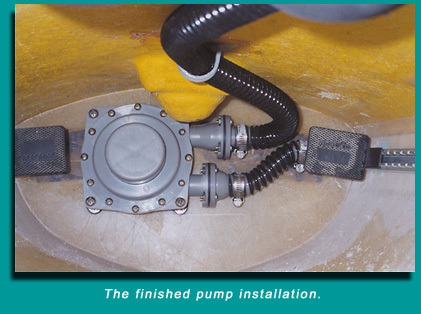 The second option is to install a hand-operated, through-deck pump. While this option lets you pump out your cockpit with your spray skirt in place, you can only keep one hand on your paddle while pumping. 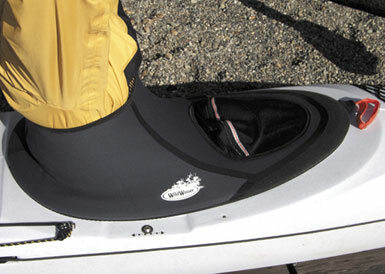 Foot-operated bilge pumps for kayaks are all bulkhead mounted. This location provides a rigid surface and, hopefully, situates the pump within comfortable reach of your feet while you are in your normal paddling position. Wooden or composite kayaks are usually well suited for mounting a foot pump as long as the bulkhead is rigid and firmly attached. In most instances, you can’t install a foot pump on the bulkhead of a plastic kayak. Caulked-in foam or plastic bulkheads are not rigid or secure enough to support the pressure of your foot working the pump. A welded-in-place plastic bulkhead may be a suitable surface for mounting a foot pump, but you should check with the manufacturer first. Since I frequently paddle by myself, I decided to install a foot pump. After some research, I settled on the Guzzler 450-S, manufactured by The Bosworth Company. It was much less expensive and somewhat more available than other foot pump models I could find. While not made specifically for the kayak market, it is nonetheless admirably suited for this purpose. It is non-magnetic, so it doesn’t affect compasses. Another option is the Irish-made Henderson pump— available in the U.K. as an option on VCP and Nigel Dennis kayaks. I couldn’t find specs for it, but it’s available in the U.S. through Great River Outfitters in Michigan for about $180. I found a few references to foot pumps on web sites based in Australia and New Zealand, and some old references to a Lendal pump. I couldn’t find any other U.S.-made foot pumps. The Guzzler 450-S has the smallest footprint of the many similar models Bosworth makes, measuring only 8 1/2″ long by 5 1/2″ wide by 4 1/2″ high (the height measurement includes 1 1/4″ for the pump button when in the extended position). This pump is rated at 1/2 liter per stroke, which works out to be between 10 and 15 gallons per minute. I specified four options when ordering this pump. The first was direct-action—instead of a pedal or handle, a large spring-loaded button is used to work the pump. 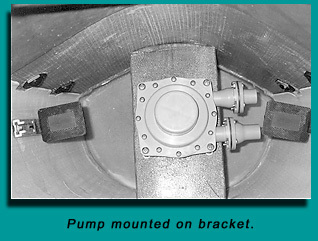 The second option was duck-bill valves—this valve type can handle small amounts of solids. 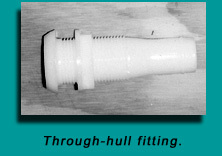 Next was 1″ end connections—a diameter smaller than one inch would reduce the pumping rate. The fourth and final option was a lightweight return spring—less effort is required to work the pump than with the standard spring. The heavier weight spring is required when water has to be lifted several feet. That’s not a concern in a kayak, so the lighter spring is more than adequate. The first step of the project is to use a piece of graph paper to do a scale drawing of the installation. Draw your bulkhead, your foot pegs or rudder pedals, a compass well and anything else that might affect your choice of pump location and orientation. Ideally, your bulkhead should be about three inches forward of your foot pegs or rudder pedals. If your bulkhead is too far away to comfortably operate a bulkhead-mounted pump, you can use either a stand-off or bracket-mounting method. The bracket-mounting method can also be used if your bulkhead is not rigid or secure enough to support the force of operating the foot pump. Additional information on these mounting methods is given near the end of this article. Use your leg length to determine how far off the bulkhead, if at all, to mount the pump. Determine your bulkhead height, width and distance from the foot pegs. Measure the bulkhead’s height at the centerline and its width at the gunwales. For the pegs, measure the distance from the forward face of the pegs to the bulkhead. If you have a compass recess located in the cockpit area, it may interfere with your ability to reach and operate the foot pump. This was the case for my boat, so I mounted the pump button to the left of center. I can also use the pump as a foot brace when necessary. If your feet are wider than the foot pegs, you should leave sufficient distance between the foot pegs and pump button to prevent your foot from accidentally hitting both at the same time. The center of the pump button should be at roughly the same height as your foot pegs or rudder pedals. Take care to avoid installing the pump between a foot peg or rudder pedal and the bulkhead. Doing so could pose a safety hazard by limiting rudder movement, restricting peg placement or snagging a foot during a wet exit. Note: Be very careful that the pump installation does not in any way interfere with the range of motion of your rudder pedals! Try to position the discharge through-hull level with the gunwale, forward of the foot peg or rudder pedal, and above, below or forward of the track as space permits. Be sure to keep enough distance between the end of the through-hull and the pump’s discharge connection to work the hose onto the through-hull. Under no circumstances should you locate the through-hull below the water line. The next step is to install mounting screws on the pump, make a jig and install the cockpit-side nuts and washers. The jig is just a scrap of plywood cut to roughly the footprint of the pump with drill bit guide holes for the pump mounting screws. You’ll use the jig for three tasks: to position the pump on the bulkhead, to drill the screw holes in the bulkhead and to position the nuts and washers on the screw shanks. Cut your jig material to size: 8 1/2″ by 5 1/2″. Place the pump, screw ends down, on the jig so that no part of the pump hangs over the edge and the screws are all parallel. Trace around the end of each screw where it contacts the jig. Drill a 1/4″ hole for each screw and check that all screws will go into their respective holes at the same time. Separate the pump from the jig so that you can put the bulkhead-side nuts and washers on the screws. First, back on the lock nuts, followed, in order, by the steel and neoprene washers. Slide the jig back on the screws until it is in contact with the pump. 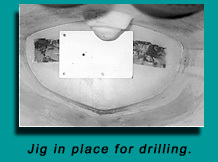 Adjust the nuts so that the neoprene washers are secured between the jig face and steel washers. To gain more room to work, you can remove your foot pegs (or rudder pedals) and tracks. The next step is to drill screw holes in the bulkhead and slide the pump into place. Stick some double-sided tape on the back of your jig and position the jig in the location you decided on in step 1. Drill the four mounting holes through the bulkhead using the jig as a guide. Remove the jig from the bulkhead, and check that the pump screws slide into place in the bulkhead. 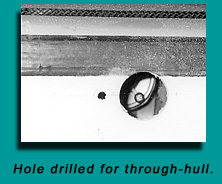 Select and mark a center point for the through-hull, and drill a 1/4″ pilot hole for your hole saw. Drill the 1 1/4″ hole for the fitting. Generously apply marine caulk to the hull side of the through-hull’s flange, then fully insert the through-hull into the hole that you drilled. Thread the nut on by hand, then tighten using a wrench. This step may require two people: one reaching inside the cockpit to turn the nut and the other on the outside to prevent the through-hull from turning. Remove the pump, and clamp on your hoses. It is much easier to attach the hoses to the pump when it’s outside of the cockpit. Slide the pump back into place. Check your hose lengths and trim to fit, if necessary. You’ll need to work through the front hatch to fasten the pump to the bulkhead. Slide a neoprene washer followed by a stainless steel washer over each screw end before starting the lock nuts. Screw the lock nuts on until tight. Cap each screw end with an acorn nut to prevent tearing any gear you stow in your forward compartment. If you are installing your strum box at the rear of the cockpit, or you need to bend the intake line to fix its position against the front bulkhead, now is the time to install your brackets. The brackets are necessary to secure the hose to the inside of the hull so that there is no possibility of your feet becoming tangled in the hose and interfering with your ability to safely exit your boat. Cut a piece of fiberglass cloth (approximately 1″ by 3″) for each bracket. For cloth weight, I used 12 oz., which is what I had on hand; however, the weight isn’t critical here. 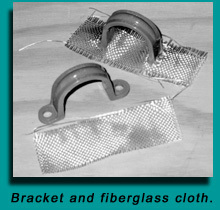 The cloth is used to provide more surface area for the resin than is provided by the bracket feet. Make two slits in each piece of cloth for the bracket feet, wide enough and far enough apart that you can easily insert a bracket foot in each. Slide the feet into the slits. Use 80-grit sandpaper to roughen the inside surface of the hull where each bracket will go. Mix your epoxy and saturate the fiberglass cloth. Set the brackets in place, smooth the cloth using your fingers (wearing latex gloves, of course) and let the resin set up. After the epoxy for the hose brackets has cured, run the line or lines through the brackets and clamp them to the through-hull and strum box as necessary. If you removed the foot pegs or rudder pedals and tracks, you can now reinstall them. Measure the distance from the bulkhead to the forward face of a foot peg or rudder pedals in the neutral position. Subtract 1 7/8″ from this measurement, and cut your plastic pipe to this length. A 2″ Schedule 80 PVC threaded coupling has the correct outside diameter. Get 20 1/4″ screws long enough to leave at least 3/4″ (room for the lock nut, washers, and acorn nut) on the other side of the bulkhead. Add 2 5/8″ plus the thickness of the bulkhead to the length of the cut pipe for this measurement. Proceed with regular installation, following steps 2 through 9. For bulkheads located more than seven or so inches forward of your foot pegs or rudder pedals, you can install a partial bulkhead made of fiberglass-covered plywood on which to mount the bilge pump. Marine plywood is your best bet, and all grades are acceptable. You can use exterior-grade plywood also, since you’ll be covering it with fiberglass and sealing the screw holes with neoprene washers. But use a CBX grade or better, and make sure to inspect the middle layer for voids. Reject any wood containing voids over 1/8″ or showing any signs of delamination. Use a profile gauge to trace the deck and hull curves onto the bracket ends. Cut the bracket about 1/4″ shorter than the deck height to allow for the thickness of cloth and epoxy. Cover the plywood with fiberglass cloth and epoxy to prevent water damage to the wood. Using the jig, drill holes for mounting the pump. Set the bracket in place. Cut four 6″ lengths of fiberglass tape, saturate with epoxy, and place over the joints where the bracket meets the deck and hull. I pool-tested the installation and was completely satisfied with the results. I hung on the outside of the bow long enough to submerge the through-hull. There was no leakage either into or around the through-hull. I then got in and sculled, with no spray skirt on, to flood the cockpit. I was easily able to pump the cockpit dry in just about one minute. I was a bit disappointed to see that the stream of water exiting the through-hull was only a bit more than a foot in length, as I’d been hoping to use the pump as a super squirt gun. On the plus side though, it’s unlikely that you will accidentally spray either yourself or a companion. I was pleasantly surprised to discover that, with the pump button set off to one side, I could use the pump in place of the foot peg as a brace. An important thing to remember is that a bulkhead-mounted foot-pump is a relatively permanent and personalized modification. Someone with legs much shorter than yours will not be able to reach the pump comfortably. Someone with legs much longer than yours may find your pump an impediment or possibly even a safety risk. If you make the decision to install a foot-operated bilge pump, you should still continue to carry your hand pump in case you need to help another paddler or to pump out one of your bulkhead compartments. With a relatively small investment in time and money, you can simultaneously pump out your cockpit, keep both hands on your paddle and have your spray skirt in place. With a hand pump, at best, you can only get two out of three. Every serious paddler, and especially those who paddle solo, should consider installing a foot-operated bilge pump. In a rough-weather situation, and with no one to raft up with, a foot pump can provide just the edge you need to make the difference between a serious situation and a minor inconvenience. And with the extra bit of confidence that knowledge should give you, it may keep you from getting into trouble in the first place.